The NSERC Industrial Research Chair in Swine Welfare says the pork sector can expect a further evolution of practices used for the care and handling of pigs. 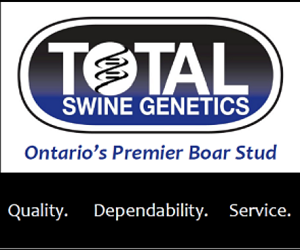 In 2014 Canada’s Code of Practice for the Care and Handling of Pigs was revised and further revisions can be expected down the road. Dr. Yolande Seddon, an assistant professor in swine behavior and welfare with the Western College of Veterinary Medicine and NSERC Industrial Research Chair in Swine Welfare, told those attending last week’s 2019 Manitoba Swine Seminar consumer attitudes toward swine welfare have been changing for many years. I have put it into a bit of a hierarchy of what could move first, really based on public acceptance of how we raise animals. In particular the system of confinement that was developed in the 1960s is perhaps something you could argue would be under the greatest scrutiny because it goes against shared values, the fact that the animal can be an animal and express it’s behavior and have a quality of life you might say so this what I have touted. We are now obviously converting to group housing from gestation stalls for sows. After that, where else do we have close confinement is for the farrowing sow at a time in her life when she is highly motivated to perform mothering behavior. That could be the next area to focus on. Then ultimately we need to be raising the bar, improving the quality of environment for the animal so we can reduce stress and actually improve positive welfare and eradicating painful procedures. Dr. Seddon says the pork sector is responding to this heightened consumer awareness, as demonstrated by the fact that we have the codes in the first place and that the sector is proceeding with renewing them.